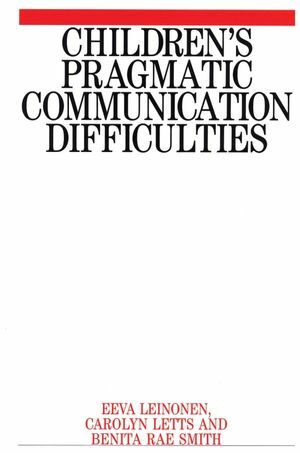 Communication problems in children that are best described as pragmatic in nature have been a focus of attention for some years. However, despite this, speech and language therapists, teachers and researchers still have some difficulty describing, defining and explaining such problems. This book gives an up to date synthesis of work in the field of childhood pragmatic problems and provides both an introduction and more detailed consideration of this complex area. Aspects covered include conversational analysis, speech and communicative acts, reference, narrative, pragmatic comprehension and relevance. Each chapter contains exercises with discussion, notes on normal development and illustrative clinical data from children, as well as recent research in the area. Eeva Leinonen and Carolyn Letts are the authors of Children's Pragmatic Communication Difficulties, published by Wiley. Communicative use of language: Speech and communicative acts.